March 21st marks spring in most places. In Maine it’s the start of mud season. All that snow has to melt. Mist hangs heavy. Sometimes it snows; other times it rains. Mud happens. 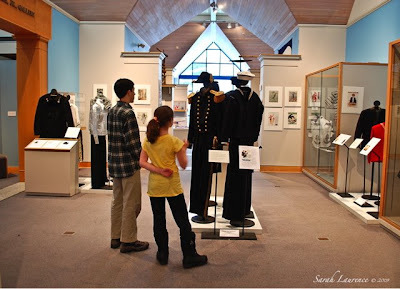 It’s a good time to visit the Maine Maritime Museum although not all the buildings are open. The museum is set in the old shipyard from back when Bath built tall ships. The white pines of the region were harvested for masts. The caulker’s shed is open year round. 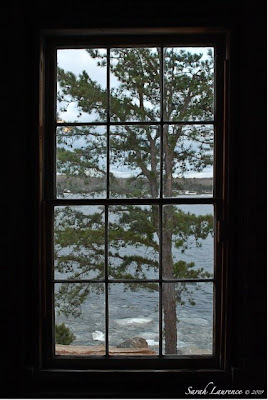 There is a nice view of the Kennebec River from inside. 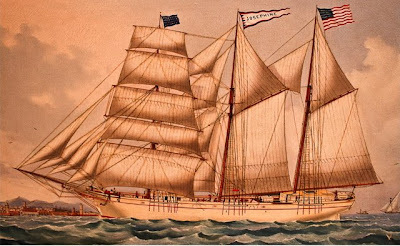 You can imagine the work that went into crafting huge clipper ships of wood in such a cold climate. It’s still below freezing at night in March. Bath has been a city since 1854 and has lovely architecture and cute shops. The current population is just under 10,000. The city is the ideal location for shipbuilding because the Kennebec River flows down to the ocean by Popham Beach. These days naval battleships, frigates, cruisers and destroyers are built at Bath Iron Works. 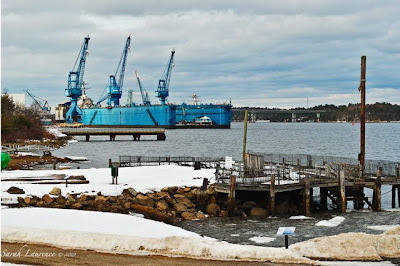 There’s a navy saying since WWII, “Bath-built is best-built.” You can see the movable dry dock and cranes from the museum grounds just a bit further up the Kennebec River. It’s a big employer in our area. You do not want to drive past when the 3:30 shift ends. The museum holds onto Bath’s long heritage as a shipbuilding city. There are lovely paintings and sailor uniforms on display. It’s well set up for visitors of all ages as my children show below. During the summer there are seal watching and light house spotting cruises. There is so much to see and to touch. I could imagine sitting down at this old desk to write a nautical tale. It got me thinking of a character . 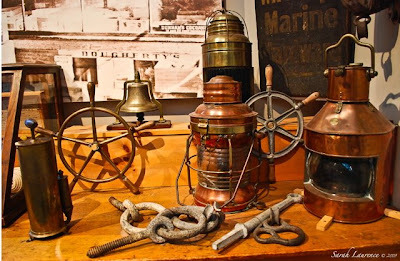 . . a curator of a nautical museum! Why not? Blog Watch: if you need a laugh, read this satirical post and book review at A Cuban In London. Expat Bee@From the Desk of Bee Drunken blogged nostalgically about Mothering Sunday in England and how it differs from Mother's Day in the USA. Elizabeth@About New York wins the diligent blogger award. She’s been blogging live from India during her month long vacation and even posting comments. Cool photos and commentary! Her last India post was up yesterday. Safe journey home! What a delightful museum and what a contrast the old view must have been with today's docks and cranes! Our neighbor has a few white pines that I have been able to watch closely as they matured. The growth rate is amazing to see and clearly one of the reasons — in addition to the straight trunk — that made them so useful in the shipbuilding trade. And thanks for the introduction to the other bloggers/posts! Ms. Wis, the sunrise photo in my post below is of mostly white pines. They grow all over Maine and you are right about the fast rate of growth. Sadly my opening shot this week features a young white pine that is dying. A bunch died in our forest two years ago and the problem isn’t gone. White pines make me think of Maine and old clipper ships. I love the haunting quality of your first shot! I love mist. Just lovely. I must come up and visit Maine soon. Just not in mud season. Perhaps this summer I'll go see some of these places you describe so beautifully. Alyson, you’d love it here in summer! Do stop by my neck of the woods when you visit. I’d love to walk with someone who would understand and share all my photo stops. You bring Maine to life! As ever, your photos are stunning. I wonder if mud season is fun or rather hard work? I think I will move in to the Caulker's shed. Looks a wonderful writing workshop. You are so kind to mention my little blog. Elizabeth, welcome back to the “real world.” I feel like I went on vacation with you. Mud season is not my favorite time of year. I thought the same thing about the Caulker’s shed – I just loved the view from that window. I love places like this. I could spend hours or days in a maritime museum. In fact, I have. Specifically the NC Maritime Museum in Beaufort. It's probably not as large or extensive as yours, but I've spent many hours in there on one trip or another. Fascinating place. Saw your comment on David's ABC Wednesday post and wanted to echo your interest in the "gory details" of photography. Many thanks for another fantastic post. I love maritime museums and have only had a sneaky peek at the one in Greenwich here in London. And I also love its surrounding grounds. The landscape is amazing, eevn though it's just starting to melt. That snow looks well solid, as if you needed an axe and a pick to break through it. And the slush left behind by the thawing must be quite hazardous, am I right? Many thanks for such extraordinary tour. Thanks for stopping by! Good tip on the polarizer, but I was already using one when I took those shots at the car show. They'll cut the glare down and help stop down that unyielding sunlight to a degree, but they still can't create shadow. You might be able to fake it a little with a gradient ND filter, but those are just a little pricey, so I haven't gotten any yet. What a good reminder to visit this wonderful museum! Your photos are subtle and beautiful. I have often joked that Utah has only 3 seasons: winter, summer and construction. Mud season? Ugh. Winter gets truly tiresome by the end of March. I've been to Bath, England -- and now I'm persuaded that I need to give Bath, Maine a try! Your photographs, as always, are superb. I particularly like the simplicity of the caulker's shed. Having spent the day looking at bad and boring photos, many of them my own, I'm even more impressed by yours. They always have such a poetic quality . . . and there's never anything extraneous. ACIL, we did take the kids to the Greenwich museum but it was disappointing although the boat ride down and park was fun. The snow is just as you describe it. We are ready to see it melt. David, thanks! The Smithsonian is great. Mojo, thanks for the tip on ND filters. But I’m on a tight budget too. Sarah, thank you and welcome to my blog! Shauna, thanks and welcome back (I’m assuming this is the same Shauna, and that you’ve started a new blog.) That one made me laugh. Bee, the two Baths are very different but both worth visiting. You only see the photos posted on my blog, not the ones I cull, but thank you. lakeviewer, I'm lucky to have so much to inspire me in Maine. Thanks for the tour. This area is also a big ship building center. I just wish the ones built here were designed to do something other than destroy (or defend). I work across the river from Newport News shipyard where aircraft carriers and nuclear subs are born. There is no recession there. Les, I do prefer recreational sailboats, but it’s not as big an industry. People in Maine really need those jobs, especially with the base closing soon. The museum features many ships without connection to the military. Yes, I've started a new blog, but it remains me! 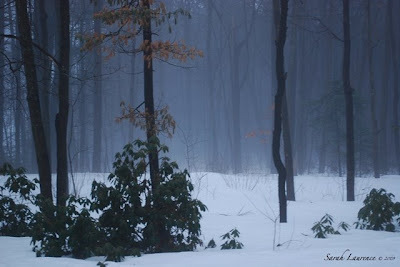 I LOVE the first pic of the trees with the snow. Would love to visit there! And the photos are just wonderful! Some remind me of the Mariner's Museum in Newport News, Virginia. Visited it 36 years ago, but still think of it. Your pictures brought it back to me again. Not to overstate my xenophobia but it's good to see they are still building something of substance in America. Go Bath! I really enjoyed this post. I was just talking with a family friend a few days ago whose mother lives in Bath. I remember driving up through there the last time I was in Maine. You're really making me want to go back and visit again! I was making plans for lunch in Brunswick next Wednesday, and realized that I had "missed Sarah's blog!" See how you and Wednesday are psychically linked for me? I love MMM and have visited with the kids for school trips many times. Your photos are spectacular, as usual. Oh, and I wanted to mention that my post today (Thursday) is about my mother, who taught school in Bath (Huse, and Small school - if they're still there) for 35 years. Shauna, great to see you back to blogging! DA, thanks! That’s my backyard. Mimi, always good to hear about other maritime museums. Tina, isn’t it funny how one rarely visits the tourist sites in one’s own backyard? ArneA, I had heard that Norway looks a lot like Maine. My son claims it could fit there like a puzzle, fjords and all. Troutbirder, I hear they do a good job. Donna, be sure to stop by on your next visit to Maine. Mary Ellen, will e-mail you about next Wednesday. Fun to own that day! I know the old high school is still in use in Bath, and it looks like Huse still exists when I googled it. Believe me...with a big white dog like Edward living in my house....mud season is not something I would look forward to!! PD Thank you for the nice comment! That would be a neat character, a curator at a nautical museum who discovers some hidden treasure! The more I see of Maine the more I like it and its nautical feel and those delightful board houses. Though I don't envy you the mud season! Pamela, tell my about it. Stella has white feathers – brown at this time of year. Rune, it was fun visiting Norway at your blog. PG, if only I could have Maine without the mud. Rose, mud season would make you wilt. Winter is nice, but I've had enough of old snow. Our late spring in May is nice and the summers and falls are gorgeous. Another wonderful trip you've given me, on this rainy day in Atlanta. Thank you for the story of Bath. Such lovely photographs, my favorite is the brilliant red chimney on the caulker's shed. A lovely post. Mama Shujaa, thanks! It’s due to rain here tomorrow. I wonder if it’s the same storm. Looks like a magical place, Sarah. Very interesting post! Lovely photos! Love the capture of the tree through the window! 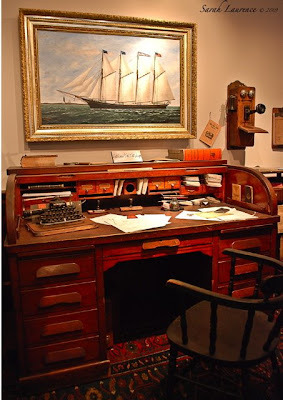 And I would love to visit a Maritime museum, looks like you have a wonderful one in Maine~great pics!! Have a beautiful week Sarah!! Cat, I had to work to find beauty beyond the mud. That window shot was my favorite too. Thanks! Maine Maritime Museum doesn't do a good job of telling folks that the first deep sea vessel VIRGINIA built by English settlers in the "New World" was built at the mouth of the Kennebec River (the same river the Museum is on) in 1607 at Popham Colony. It was built for coastal trade and exploration, but was used to get the remaining men back to England in 1608 when they dissolved the colony due to lack of leadership. 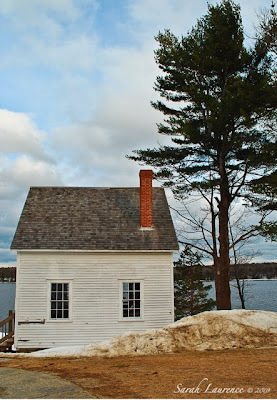 The Museum sits in the middle of the sites of the oldest (Popham Colony) and the newest (BIW). I do love museums. And lanterns. Thank you for the links. Oh how glorious! I would be happy to live in the caulker’s shed with my brushes and tubes...and my camera! Anonymous, thanks for more historical details. Barrie, let’s hear it for museums and lanterns! Tessa, it would be an especially nice place to paint there on a rainy day. I am lucky to live in such an inspirational place. I’ll thank my parents for those creative genes. Great story. I remember mud season from when I lived in Vermont. DFP, great to reconnect with you. Mud season is not easily forgotten. I'm wishing mud to become a memory soon. Spring is almost on the air today. 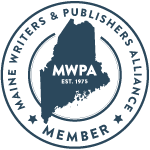 Your post and exposure of Maine is super!